Lillian and I woke in darkness, grabbed breakfast, and went to the Salt Lake City Box Office at Trolley Square. We weren’t super early, and the line wasn’t too bad. We decided to wait and see what they had available, looking especially to get tickets to An Education, the movie starring Emma Thompson and written by Nick Hornby (About a Boy, High Fidelity). Lillian is a massive Emma Thompson and Nick Hornby fan, so we kept our fingers crossed. They didn’t have any, but they did have tickets for a bunch of other films we were interested in. We decided to snag a pair to the 9pm screening of Mystery Team, since we already had tickets for The Missing Person before it. Then we drove into Park City to see if we could waitlist for An Education. By the time we parked ($20, China Bridge) and got to the Egyptian Theatre, the wait list line was already some 70 deep, even though we were there three and a half hours before the show. Knowing it was a small theater, we decided to see if we could purchase tickets outside. We created a sign that read “WE NEED tickets for AN EDUCATION”. The sign got us lots of laughs and sympathy, and the LA Times took our photo, but after an hour or so, we grew tired of holding it up, and wandered into the New Frontiers exhibit across the street. Somewhere in all of this, Lillian lost a glove. So, with our friend Muriel from The Only Good Indian, we checked out all the apparel shops on Main Street for new Lillian-worthy gloves. None were found, and it was time to head back to Salt Lake for the two films we had tickets to, The Missing Person and Mystery Team. We had a nice dinner across the street from the classy Rose Wagner center, and then crossed and queued for The Missing Person. The concessions at Rose Wagner had an excellent selection of gourmet treats. (I recommend grabbing some banana bread while waiting in line. Before The Missing Person, there was a Michael Haneke-knockoff short called “Protect You + Me”. It was made in an intentionally baffling and film-school way. I have no doubt that it had symbolic meaning to the filmmakers; but it was opaque to me and the rest of the audience, who barely managed a polite three claps after the inexplicable conclusion. The Missing Person is another data point in my theory that Sundance will let a weak movie in if it has stars. In this case, the stars are two of my favorite emerging actors, Michael Shannon and Amy Ryan. It was by far my least favorite film of the festival, and I’m still deciding whether its good moments outweigh the bad. I thought Michael Shannon was the best part of Revolutionary Road. But after watching this film, in which he is in every scene, I’m inclined to think he’s best in small doses. (Lillian disagreed; she loved the performance.) In The Missing Person, Shannon plays a hard-pickled detective assigned to follow a man who may or may not be involved in child trafficking. The tale is told in a self-consciously noirish fashion by screenwriter/director Noah Buschel. At first, it meanders in a mildly entertaining manner, as Shannon’s drunken John Rosow, P.I. plays the straight man in encounter after encounter with wacky characters. Paul Sparks as cab driver Gus Papitos and Gary Wilmes as Officer Chehak are the most memorable encounters. Unfortunately, these encounters do little to move the plot forward. The team behind the film clearly has great talent, but the uneven pacing of the story killed any chance for that to shine. And I was sad that Amy Ryan, even though she’s listed also as an exec producer, was given very little to do in the movie. She needed a place where she could unleash her best Lana Turner/Barbara Stanwyck. We didn’t stick around for The Missing Person‘s Q&A and instead traded the classy Rose Wagner for the classic Tower Theater across town. The Tower has no lobby to speak of, so the line was entirely on the sidewalk in front, down the street and bending around the corner. Off-leash dogs amusing themselves while their owners sipped coffee at the next door café weaved in and out of the crowd. I was glad to see such a large crowd, especially since there had been tickets available that morning. I happen to have gone to school with several members of the Derrick Comedy team that made the film. I was also glad to see that it was a young crowd, one likely to be in tune with Derrick Comedy’s edgy humor, the humor that has made their viral video sketches internet hits. The crowd filled every seat of the deteriorating old theater, giddily awaiting what might be the next Napoleon Dynamite. Mystery Team isn’t Napoleon Dynamite and probably won’t ‘break out’ like it. I think it still has good chances with the college crowd. Not all the jokes land, and sometimes that’s a matter of editing. But it doesn’t make one rookie comedy mistake Napoleon did, not having a strong plot. Mystery Team sets out to show what would happen when squeaky-clean kid detectives like Encyclopedia Brown and Hardy Boys grew up, and does just that, following them as they attempt to solve an ‘adult’ mystery — a double homicide — and deal with the ‘adult’ feelings at the fringes of their naïve worldview. 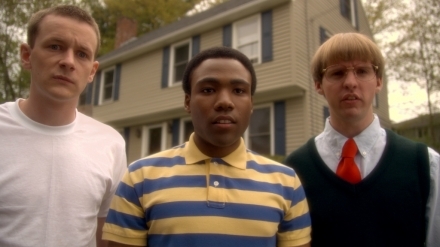 Although they got some titters with sit-commy one-liners, the biggest laughs came when the team — Jason “The Master of Disguises” (Donald Glover), Duncan “The Boy Genius” (DC Pierson) and Charlie “The Strongest Kid in Town” (Dominic Dierkes) — stay in madcap character. Dierkes’ idiotic reactions, in particular, put a goofy new spin on a character we’ve seen countless times. The real star of the film is Glover, whose huge talent back was plain when I was in school, and who is currently a staff writer for TV’s 30 Rock. He not only anchors the movie as the central character of the Mystery Team, his inventive and candy-coated musical score is what makes the wacky world of the film one that you don’t want to leave. The movie has generally good supporting turns, especially Upright Citizen Matt Walsh’s extended cameo as a hard-partying cubicle cowboy. He had one line, which I won’t spoil, that absolutely brought the house down. I was alternatively amused and angered by SNL’s Bobby Moynihan’s grocery store informant. He was at his best when commiserating giddily with the Team, and at his worst when slipping into his tired ‘ghetto fab’ character and spastickly hucking ice cream sandwiches. Overall, the film looks like a promising start to what could be a comedy movement something like the present Team Apatow. I hope they get a distribution deal that not only pays well, but gets the movie out to everyone. If they don’t get traditional distro, you can bet Mystery Team‘s going viral on the internet. The Derrick Comedy team, strong improv comedians, missed a chance by answering Q&A questions rather honestly. The audience asked a few – nothing much was revealed, other than that the screenplay was written collaboratively, the movie was shot on RED (and looked fantastic!) and that they set action in a lumberyard because one member had an uncle who could get them access to a lumber yard. Mystery Team was the last of the movies I saw at Sundance. My favorite was probably Humpday, followed by Unmade Beds, whose beauty has haunted me since I saw it. Though we didn’t get into An Education, I felt Lillian and I got an education in Sundansology. Where to park, what to see and how to enjoy independent film’s most-hyped and most hype-worthy festival.